Click here to view great BABIN gift ideas! 1. ANTOINE1 BABIN (Source: (1) Steve Fleming, Internet WWW Page: "Someday - A Place for Genealogy" and Linda Jones, "Babins - From Antoine to the Present" found on the WWW/Internet., (2) The Acadian Miracle by Dudley LeBlanc, Pub. Evangeline Pub. Co., Lafayette LA, 1966 p. 377, Census of Acadia in 1686.) was born Abt. 1626 in LaChasse, Vienne, France, and died Aft. 1686 in Port Royal, Acadia. He married MARIE MERCIER Abt. 1662 in Vienne, France, daughter of JEAN MERCIER and FRANCOISE GAUDET. She was born Abt. 1645, and died Abt. 1736.
i. MARIE2 BABIN, b. 1663. 2. ii. CHARLES BABIN, b. 1664, Port Royal,Acadia. 3. iii. VINCENT BABIN, b. 1665, Port Royal, Acadia. iv. JEANNE BABIN, b. 1667, Port Royal, Acadia; m. (1) MICHEL RICHARD, Abt. 1683; m. (2) LAURENT DOUCET, 1689.
v. MARGUERITE BABIN, b. 1670, Port Royal, Acadia; m. ANTOINE BREAUX, 1670, Port Royal, Acadia. vi. CATHERINE BABIN, b. 1672.
vii. ANNE BABIN, b. 1674, Port Royal, Acadia; d. Pisiquit, Acadia; m. ALEXANDER ABRAHAM DOURARON, 1695, Pisiquit, Acadia. viii. ANTOINE BABIN, JR., b. 1676.
ix. MADELEINE BABIN, b. 1678, Port Royal, Acadia; m. JEAN MARTIN, Abt. 1695, Port Royal, Acadia. 4. x. FRANCOISE BABIN, b. 1681, Port Royal,Acadia. xi. JEAN BABIN, b. 1684, Port Royal, Acadia; d. Pisiguit, Acadia; m. MARGUERITE BOUDROT, Abt. 1704, Pisiguit, Acadia; b. Port Royal, Acadia. 2. 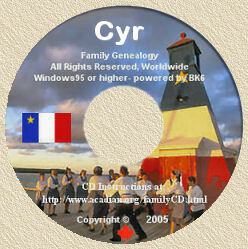 CHARLES2 BABIN (ANTOINE1) (Source: (1) Steve Fleming, Internet WWW Page: "Someday - A Place for Genealogy" and Linda Jones, "Babins - From Antoine to the Present" found on the WWW/Internet., (2) The Acadian Miracle by Dudley LeBlanc, Pub. Evangeline Pub. Co., Lafayette LA, 1966, p. 387 Census of the Mines, 1714, Grand Pre.) was born 1664 in Port Royal,Acadia. He married MAGDELAINE RICHARD 1686 in Port Royal,Acadia, daughter of MICHEL RICHARD and MADELEINE BLANCHARD. She was born 1670 in Port Royal,Acadia. i. ANNE3 BABIN, b. 1688.
ii. MARGUERITE BABIN, b. 1690. 5. iii. RENE BABIN, b. 1692, St Charles des Mines, Acadia. iv. PIERRE BABIN, b. 1694, St Charles des Mines, Acadia; m. MARIE MADELEINE BOURG, Abt. 1714, Mines, St. Charles Parish, Acadia. v. CLAUDE BABIN, b. 1698, St Charles des Mines, Acadia; d. Abt. 1768; m. MARGUERITE DUPUIS, November 14, 1718. 6. vi. JEAN BAPTISTE BABIN, b. 1700, St. Charles des Mines, Grand Pre, Acadia; d. September 17, 1774, St. Servan, France. vii. JOSEPH BABIN, b. 1702, St Charles des Mines, Acadia; d. 1752, St Charles des Mines, Acadia; m. ANGELIQUE LANDRY. viii. CHARLES BABIN, b. February 13, 1706/07, St. Charles des Mines, Acadia; d. January 03, 1731/32, St. Charles des Mines, Acadia; m. ANNE MARIE MELANSON, July 10, 1729, St Charles Parish, Acadia. ix. MARIE BABIN, b. February 13, 1707/08. x. MADELEINE BABIN, b. June 15, 1710.
xi. ISABELLE BABIN, b. June 16, 1711.
xii. MARGUERITE BABIN, b. July 04, 1712. 3. VINCENT2 BABIN (ANTOINE1) was born 1665 in Port Royal, Acadia. He married ANNE THERIOT Abt. 1687 in Port Royal, Acadia, daughter of CLAUDE THERIOT and MARIE GAUTEROT. i. CLAIRE3 BABIN, m. PIERRE LANDRY, 1729. 4. FRANCOISE2 BABIN (ANTOINE1) was born 1681 in Port Royal,Acadia. She married JEAN PITRE (Source: (1) The Learning Company, Inc., World Family Tree Vol. 30 (Disk #2), Ed. 1, (Release date: January 11, 1999), "CD-ROM," Tree #0965, Date of Import: Sep 21, 1999., (2) Pesseley WFT31, 965.FTW, Date of Import: Sep 21, 1999.) 1698 in Cobequid, Acadia, son of JEAN PITRE and MARIE PESSELEY(T). He was born 1680 in Port Royal,Acadia, and died WFT Est. 1704-1771 (Source: (1) The Learning Company, Inc., World Family Tree Vol. 30 (Disk #2), Ed. 1, (Release date: January 11, 1999), "CD-ROM," Tree #0965, Date of Import: Sep 21, 1999., (2) Pesseley WFT31, 965.FTW, Date of Import: Sep 21, 1999.). 7. i. JEAN BAPTISTE3 PITRE, b. Abt. 1699, Acadia; d. 1758, At Sea. 5. RENE3 BABIN (CHARLES2, ANTOINE1) was born 1692 in St Charles des Mines, Acadia. He married ISABELLA GAUTEROT November 26, 1714 in Mines, St. Charles Parish, Acadia, daughter of CLAUDE GAUTEROT and MARIE THERIOT. i. JOSEPH4 BABIN, b. September 24, 1720, Mines, St. Charles Parish, Acadia; m. MARGUERITE LEBLANC, November 22, 1745, Mines, St. Charles Parish, Acadia. 6. JEAN BAPTISTE3 BABIN (CHARLES2, ANTOINE1) (Source: (1) Steve Fleming, Internet WWW Page: "Someday - A Place for Genealogy" and Linda Jones, "Babins - From Antoine to the Present" found on the WWW/Internet., (2) World Family Tree Vol 4, Pedigree # 0385.) was born 1700 in St. Charles des Mines, Grand Pre, Acadia, and died September 17, 1774 in St. Servan, France. He married MARGUERITE TERRIOT October 14, 1721 in St. Charles des Mines, Acadia, daughter of JEAN THERIOT and JEANNE LANDRY. She was born 1702 in Grand Pre, Acadia, and died August 1756 in Southampton, England. i. MARIE4 BABIN, b. March 04, 1722/23, St. Charles des Mines, Acadia; m. EMMANUEL HEBERT, October 29, 1744, St. Gabriel, Louisiana. ii. ELIZABETH BABIN, b. April 27, 1726; m. MATURIN LEBLANC, October 16, 1747, Grand Pre, Acadia. iii. OLIVIER BABIN, b. 1728, St. Charles des Mines, Acadia; d. January 25, 1746/47, St. Gabriel, Louisiana. iv. JOSEPH BABIN, b. July 10, 1730, St. Charles des Mines, Acadia; m. FRANCOISE DUGAS, December 25, 1765.
v. PAUL BABIN, b. January 06, 1731/32. vi. FRANCOISE BABIN, b. September 11, 1733. 8. vii. SIMON BABIN, b. October 09, 1735, St. Charles des Mines, Acadia; d. October 02, 1780, Aboard ship "Le Prince Izare". viii. MARGUERITE BABIN, b. February 28, 1738/39. ix. MARIANNE BABIN, b. June 28, 1743, St. Charles des Mines, Acadia; d. September 02, 1743, Acadia. x. ANNE BABIN, b. October 31, 1745; m. JEAN RAVAIEUX, July 24, 1770, St. Servan, France. 7. JEAN BAPTISTE3 PITRE (FRANCOISE2 BABIN, ANTOINE1) was born Abt. 1699 in Acadia, and died 1758 in At Sea. He married MARGUERITE TERRIOT Abt. 1726 in Cobequid, Acadia, daughter of PIERRE THERIOT and MARIE BOURG. She was born Abt. 1701 in Cobequid, Acadia, and died Abt. 1758 in At Sea. 9. i. MARGUERITE4 PITRE, b. 1740, Grand Pre, Acadia; d. Abt. 1807, Lafourche Parish, Louisiana. 8. SIMON4 BABIN (JEAN BAPTISTE3, CHARLES2, ANTOINE1) (Source: Steve Fleming, Internet WWW Page: "Someday - A Place for Genealogy" and Linda Jones, "Babins - From Antoine to the Present" found on the WWW/Internet.) was born October 09, 1735 in St. Charles des Mines, Acadia, and died October 02, 1780 in Aboard ship "Le Prince Izare". He married (1) ANASTASIE TERRIOT Abt. 1759 in Southampton, England. She was born 1742 in Acadia, and died April 18, 1775 in Chaterault, France. He married (2) ANNE POIRIER September 18, 1775 in St. Jacques, Chatellerault, France. i. ANNE5 BABIN, b. 1758, England; d. July 17, 1765, St. Servan, France. ii. MARIE BABIN, b. September 30, 1761, Southhampton, England; m. LOUIS-WILLIAM STEBENS, January 02, 1783, St. Martin of Chantenay, France. iii. MAGLOIRE BABIN, b. January 01, 1762, England. iv. ANASTASIE VICTOIRIE BABIN, b. October 19, 1764, St. Servan, France; d. July 02, 1767, St. Servan, France. 10. v. FRANCOIS MARIE BABIN, b. November 16, 1766, St. Servan, France; d. Abt. 1810, Thibodaux, Louisiana. vi. PIERRE JOSEPH BABIN, b. June 04, 1769, St. Servan, France. 9. MARGUERITE4 PITRE (JEAN BAPTISTE3, FRANCOISE2 BABIN, ANTOINE1) was born 1740 in Grand Pre, Acadia, and died Abt. 1807 in Lafourche Parish, Louisiana. She married JOSEPH MARTIN, SR. Abt. 1764, son of AMBROISE MARTIN and ANNE CYR. He was born 1736 in Beaubassin, Acadia, and died January 09, 1795 in Convent, St. James Parish, Louisiana. 11. i. JOSEPH5 MARTIN, JR., b. 1765; d. Bef. November 25, 1815, Thibodaux, Louisiana. ii. MICHEL MARTIN, b. 1773; m. MARGUERITE GRABERT; b. 1776; d. 1838.
iii. MARGUERITE MARTIN, b. 1769; m. ADAM MATHERNE. iv. MARIE MARTIN, b. 1771; m. JEAN BAPTISTE PHELIPPEAUX. v. PELAGIE MARTIN, b. 1775. 10. FRANCOIS MARIE5 BABIN (SIMON4, JEAN BAPTISTE3, CHARLES2, ANTOINE1) was born November 16, 1766 in St. Servan, France, and died Abt. 1810 in Thibodaux, Louisiana. He married ANNE-MARIE USEE December 31, 1786 in St. Gabriel, Louisiana, daughter of IGNACE USE and CECILE BOURG. She was born February 01, 1764 in St. Servan, France. i. MARIE MAGDALENA6 BABIN, b. October 10, 1787, St. Gabriel, Louisiana; d. 1823, Thibodeaux, Louisiana; m. (1) JACQUES COMTE, February 01, 1807, Donaldsonville, Louisiana; m. (2) EUGENE TOUPS, October 06, 1819.
ii. ANNE EMILIE BABIN, b. December 11, 1789, Plattenville, Louisiana; m. FRANCOIS ROBICHAUX. 12. iii. FRANCOIS AUGUSTE BABIN, b. January 24, 1792, Donaldsville, Louisiana. iv. MARIE SCHOLASTIQUE BABIN, b. February 24, 1793, Plattenville, Louisiana; m. EUGENE TOUPS, May 26, 1816.
v. JEAN BAPTISTE BABIN, b. July 15, 1797, Plattenville, Louisiana; m. MARIE AGLAE GISCLAIR, November 04, 1828. 13. vi. FRANCOIS BABIN, b. October 05, 1799, Plattenville, Louisiana. vii. RAPHAEL EDOUARD BABIN, b. January 19, 1803, Plattenville, Louisiana. 11. JOSEPH5 MARTIN, JR. (MARGUERITE4 PITRE, JEAN BAPTISTE3, FRANCOISE2 BABIN, ANTOINE1) (Source: Inventory of Joseph Martin, Nov. 25, 1815, Thibodaux, LA..) was born 1765, and died Bef. November 25, 1815 in Thibodaux, Louisiana. He married MARIE CHARPENTIER October 16, 1787 in St. James Parish, Louisiana, daughter of PIERRE CHARPENTIER and MARIE MONTARD. i. CELESTE MATHILDE6 MARTIN, m. PAUL ST. PIERRE. ii. CHREJUSTIN MARTIN, m. MARIE MODESTE LECOMPTE, February 28, 1829.
iii. GEORGE ST. VILLE MARTIN. iv. JOSEPHINE MARTIN, m. LOUIS SICARD, December 24, 1831.
vi. MARIE CERONIE MARTIN, m. JAMES PRICE, February 23, 1832.
vii. MARIE NATHALIE MARTIN, m. (1) JEAN BAPTISTE THIBODEAUX; m. (2) EVARISTE LEPINE, September 14, 1825.
ix. SAINVILLE MARTIN, m. MARIE HELOISE BLANCHARD, April 12, 1830. 14. x. ELIZA EUPHROSYNE MARTIN, b. June 02, 1801. 12. FRANCOIS AUGUSTE6 BABIN (FRANCOIS MARIE5, SIMON4, JEAN BAPTISTE3, CHARLES2, ANTOINE1) was born January 24, 1792 in Donaldsville, Louisiana. He married JUSTINE TOUPS February 18, 1822 in Thibadoux, Louisiana, daughter of ANDRE TOUPS and MARIE DERVIN. i. MARIE JUSTINE7 BABIN, b. July 18, 1822.
ii. ELIZA BABIN, b. Abt. 1824.
iii. TOUSSAINT MARCELLIN BABIN (Source: World Family Tree Vol 4, Pedigree 0395. ), b. November 01, 1825, Thibodeaux, Louisiana; d. April 12, 1912, Raceland, Louisiana; m. (1) MARIE LANDRY; m. (2) CARMELITE GRABERT, 1846, Raceland, Louisiana. iv. AUGUSTE BABIN, b. December 20, 1830.
v. SERAPHINE BABIN, b. March 22, 1832.
vi. MARCELLINE BABIN, b. March 06, 1834.
vii. JUSTIN BABIN, b. February 02, 1837.
viii. EMELIE BABIN, b. Abt. 1838.
ix. AMEDEE BABIN, b. March 20, 1838; m. ZULEMA FOLSE, November 30, 1858.
x. AURELIE BABIN, b. February 24, 1841. 13. FRANCOIS6 BABIN (FRANCOIS MARIE5, SIMON4, JEAN BAPTISTE3, CHARLES2, ANTOINE1) (Source: Parish Records, Bayou La Fourche, Louisiana; Ruby P. Babin - Terrebonne Gen. Society.) was born October 05, 1799 in Plattenville, Louisiana. He married ELIZA EUPHROSYNE MARTIN August 20, 1821, daughter of JOSEPH MARTIN and MARIE CHARPENTIER. She was born June 02, 1801. 15. i. JOSEPH FRANCOIS7 BABIN, b. January 30, 1822, Thibodaux, Louisiana. ii. EUPHROISINE SERAPHINE BABIN, b. November 22, 1823, Thibodaux, Louisiana. iii. LOUIS BABIN, b. November 22, 1823, Thibodaux, Louisiana. iv. EDOUARD BABIN, b. February 14, 1827, Thibodaux, Louisiana. v. GUILLAUME MARCELIN BABIN, b. March 27, 1829, Thibodaux, Louisiana. 14. ELIZA EUPHROSYNE6 MARTIN (JOSEPH5, MARGUERITE4 PITRE, JEAN BAPTISTE3, FRANCOISE2 BABIN, ANTOINE1) was born June 02, 1801. She married FRANCOIS BABIN (Source: Parish Records, Bayou La Fourche, Louisiana; Ruby P. Babin - Terrebonne Gen. Society.) August 20, 1821, son of FRANCOIS BABIN and ANNE-MARIE USEE. He was born October 05, 1799 in Plattenville, Louisiana. Children are listed above under (13) Francois Babin. 15. JOSEPH FRANCOIS7 BABIN (FRANCOIS6, FRANCOIS MARIE5, SIMON4, JEAN BAPTISTE3, CHARLES2, ANTOINE1) (Source: Records of Algiers LA.) was born January 30, 1822 in Thibodaux, Louisiana. He married MARIE ANNA ODILE BORNE (Source: Baptismal Records.) January 31, 1848 in New Orleans, Louisiana, daughter of BENJAMIN BORNE and MARIE DE LA TOUR. She was born Bef. August 1832 in Louisiana, and died July 20, 1867 in Algiers, Louisiana. i. EMMA MARIE8 BABIN (Source: David Monroe, Metairie LA.). 16. ii. MARGARET (MARY) CECILE BABIN, b. October 25, 1850, Algiers Louisiana; d. January 17, 1944. 17. iii. JULES BENJAMIN BABIN, b. May 19, 1858, Louisiana; d. January 14, 1917, Algiers Louisiana. 18. iv. JOSEPHINE BABIN, b. 1860, Algiers Louisiana; d. 1952, New Orleans Louisiana. 19. v. VICTORIA BABIN, b. Unknown; d. Unknown. 16. MARGARET (MARY) CECILE8 BABIN (JOSEPH FRANCOIS7, FRANCOIS6, FRANCOIS MARIE5, SIMON4, JEAN BAPTISTE3, CHARLES2, ANTOINE1) was born October 25, 1850 in Algiers Louisiana, and died January 17, 1944. She married LOUIS ANTOINE HYMEL August 08, 1867 in Algiers Louisiana, son of AUGUSTIN HYMEL and MARIA TRAGRE. He was born November 19, 1843 in Vacherie, Louisiana (Source: Margaret Cecilia Hymel, researcher for family of Frank and Ida Hymel, and Rosemary Elfer, descendant of Benjamin Borne..), and died August 25, 1906 in Algiers Louisiana. ii. FRANK CREPIN HYMEL, b. October 25, 1871.
iii. MARIE ODILE HYMEL, b. April 01, 1874.
iv. CECILIA LOUISE HYMEL, b. April 01, 1876.
v. EVALINA HYMEL, b. 1882.
vi. EDWARD JOSEPH HYMEL, b. April 26, 1885.
vii. GEORGE HYMEL, b. Unknown. 17. JULES BENJAMIN8 BABIN (JOSEPH FRANCOIS7, FRANCOIS6, FRANCOIS MARIE5, SIMON4, JEAN BAPTISTE3, CHARLES2, ANTOINE1) (Source: Obituary, Personal Knowledge, father of Walter F. Babin.) was born May 19, 1858 in Louisiana, and died January 14, 1917 in Algiers Louisiana. He married ANTOINETTE JANE MCLEAN (Source: Personal Knowledge, Obituary, Mother of Walter F. Babin.) November 25, 1880 in New Orleans Louisiana, daughter of JOHN MCLEAN and MARY SWEETLAND. She was born April 05, 1861 in New Orleans Louisiana, and died September 26, 1947 in New Orleans Louisiana. i. WILLIAM BENJAMIN9 BABIN, b. January 03, 1882, Algiers Louisiana; d. October 18, 1953, New Orleans Louisiana; m. ELIZABETH MOMIE KINKAID, October 05, 1905, New Orleans Louisiana; b. October 22, 1883, Algiers Louisiana; d. October 04, 1969, New Orleans Louisiana. ii. GEORGE LEWIS BABIN, b. December 06, 1885, Algiers Louisiana; d. June 18, 1967, Metairie, Louisiana; m. (1) MARY CHRISTIE; m. (2) MAYDE GRANT, November 02, 1950; b. May 09, 1903, Greenville , Alabama; d. March 25, 1989, Metairie, Louisiana. iii. LILLIAN ODILE BABIN, b. December 28, 1886, New Orleans Louisiana; d. March 01, 1985, New Orleans Louisiana; m. (1) JOHN ANDREW HOFSTETTER, November 07, 1906, New Orleans Louisiana; b. June 07, 1882; d. February 16, 1949; m. (2) DAVID CARSON HOLMAN, December 10, 1952, New Orleans Louisiana; b. November 22, 1879; d. March 24, 1960.
iv. MARY VIRGINIA BABIN, b. October 27, 1888, Algiers Louisiana; d. September 07, 1958, New Orleans Louisiana; m. JAMES HENRY KEPPER, March 18, 1911, New Orleans Louisiana; b. August 03, 1887, Algiers, Louisiana; d. October 28, 1970, New Orleans Louisiana. v. JULIETTE CALANTHE BABIN, b. July 22, 1892, Algiers, Louisiana; d. January 04, 1989, Atlanta, Georgia; m. NICHOLAS EMILE JACQUES SAVINI, January 06, 1917, Algiers, Louisiana; b. December 20, 1892, New Orleans Louisiana; d. September 18, 1957, Atlanta, Georgia. vi. EULALIE LOUISE BABIN, b. December 11, 1893, Algiers, Louisiana; d. November 27, 1976, New Orleans, Louisiana; m. ROBERT J. PLATT, December 24, 1917; b. August 29, 1891, Algiers, Louisiana; d. May 15, 1979, New Orleans, Louisiana. vii. WALTER FLOWER BABIN (Source: Personal Knowledge, Birth Certificate, Baptismal Certificate, Marriage License, Death Certificate. ), b. November 07, 1899, Algiers Louisiana; d. January 16, 1988, Memphis Tennessee; m. (1) JESSIE VIRGINIA HASTE (Source: Personal Knowledge, Birth Certificate, Baptismal Certificate, Marriage License, Death Certificate. ), December 05, 1922, Memphis Tennessee; b. August 28, 1903, Trenton Tennessee; d. August 22, 1962, Memphis Tennessee; m. (2) MARY BELLE THOMASON, July 09, 1964, Germantown, Tennessee; b. February 21, 1908, Osceola, Arkansas; d. June 19, 1997, Memphis Tennessee. 18. JOSEPHINE8 BABIN (JOSEPH FRANCOIS7, FRANCOIS6, FRANCOIS MARIE5, SIMON4, JEAN BAPTISTE3, CHARLES2, ANTOINE1) was born 1860 in Algiers Louisiana, and died 1952 in New Orleans Louisiana. She married BRADFORD JAMES WILLIAMS, son of JAMES WILLIAMS and MARY ALLEN. He was born 1859 in New Orleans Louisiana, and died 1932 in New Orleans Louisiana. i. BERTHA EMMA9 WILLIAMS, b. 1883, Algiers, Louisiana; d. 1980, New Orleans, Louisina; m. HARRY A. MONROE; b. 1880; d. 1960.
ii. OLIVE WILLIAMS, b. 1887, Algiers, Louisiana; d. 1971, New Orleans, Louisina. iii. ALVIN WILLIAMS, b. Unknown, Algiers, Louisiana; d. October 11, 1918, France - World War II. iv. J. BRADFORD WILLIAMS, b. Unknown, Algiers, Louisiana. v. JOSIE WILLIAMS, b. Unknown, Algiers, Louisiana; d. New Orleans, Louisina; m. AUGUST CELLES. vi. CORA LOUISE WILLIAMS, b. Unknown, Algiers, Louisiana; d. 1919, New Orleans, Louisina; m. BEN MICHELL. 19. VICTORIA8 BABIN (JOSEPH FRANCOIS7, FRANCOIS6, FRANCOIS MARIE5, SIMON4, JEAN BAPTISTE3, CHARLES2, ANTOINE1) was born Unknown, and died Unknown. She married JAMES BURNS. He was born Unknown, and died Unknown. i. CECILE9 BURNS, m. PHELAN. iv. AGNES BURNS, b. Unknown; d. Unknown; m. GUSTAVE SCHADOWSKY; b. Unknown; d. Unknown.